It’s been a while since I’ve blogged and I owe several of you for your kind comments reacting to my posts. It’s a fun way to connect with you, and I’m sorry I can’t take the time to answer all of your questions. Spring Training is winding down and the season openers will be here this week. I still think we are losing that special feeling baseball has had over the years of having the first opener in the daytime in Cincinnati and the others a day later. In Japan? And at night? Stop it! Forgive me for being so traditionally minded. I’m all for progress that is in the best interest in the game, but this is not it for me. I know, TV swings the hammer and I have made a nice living from talking baseball on TV but I still think there could be some compromise instead of always deciding in favor of the financial benefits and not common sense. My grandchildren will never know how special Opening Day of baseball season should be because of the current approach. Okay, I’m off my soapbox. How about the ridiculous injuries suffered by players this spring! I wouldn’t even mow my own lawn with a power mower because of the injury former lefty, Curt Simmons, suffered in the 50s. Nipped off some toes mowing his lawn. I remember Bobby Grich, All-Star second baseman, who signed a lucrative contract with the Angels and injured his back carrying an air conditioner up the stairs. Please guys, think about your career and your team and the investment the organization has in you before you do things that could ruin your life and your career — or your career and your life. Either way. I enjoyed playing a little raquetball and basketball in the offseason, but it was for conditioning and recreation and I felt like I was in pretty good control of my actions. Too much emphasis on stats, scores, and radar gun readings. Who cares? My point of reference would be the spring of 1975. One of my last spring starts befoe the season started was against the Red Sox in Winter Haven, Florida. Chuck Tanner had to take me out in the 2nd inning. I was hoping to go six or seven. Gave up nine runs, three or four home runs. Deron Johnson hit two, I think maybe Jim Rice and Freddy Lynn had one also. All the infielders played a few steps deeper than normal. Outfielders were out of breath chasing down the extra base hits.We all had a good laugh about it. I was 36 years old. Today some would be up in arms saying things like “Is his velocity way down?” “Is his career coming to an end?” I started that season 5-0, went to 9-1 and then 13-5 at the All Star break and made the 1975 All star team.Do any of you Cardinal fans remember what David Freese‘s spring stats were in 2011? My point is, the wind blows out in a lot of ballparks in Florida in the spring. Fly balls become home runs. Pitchers are just getting their arms conditioned. There is no incentive to win a game. It’s just practice, for crying out loud. Don’t worry about stats and wins and radar gun readings. Let’s start paying attention when the bell rings, which for me is the first game in Cincinnati, no matter what the schedule says. I’m prepping for my season opener, which will be April 12 on MLB Network with Bob Costas. Marlins at Phillies. Hope it’s Halladay vs. Johnson. Finally. The Super Bowl is history, golf season is under way and… pitchers and catchers have reported to Spring Training. Always an exciting time for baseball fans and teams. New faces will appear this spring as hopefuls to turn a franchise into a contender or a contender into a champion. A Bryce Harper, Yu Darvish and Mike Trout — and many we have yet to hear about. I enjoy reading the various newspapers from big league cities to get the advance reports on what fans can hope to expect. For example, Boston is faced with trying to make the media and their fans forget the somewhat embarrassing collapse and clubhouse behavior of last September. Speaking from personal experience, the behavior issue was way overstated as a reason and the on-field performance was one pitch or one hit from being overlooked. These days that one pitch or hit can lead to a World Series, as it did for the Cardinals. Detroit’s expectations will be to get to the World Series and maybe win it. They will be the choice to win the AL Central handily, but they still have to catch the ball and get the last six outs of the game. Those are two areas we have found out are most important in baseball. For example, the fly ball over Nelson Cruz’s head and the failure to put the Cardinals away when they had a chance was responsible for Texas not winning the World Series. I’m not going to evaluate every team here, but every camp you visit in February and March will be full of optimism. As my former manager, Whitey Herzog, would say, “We’re just two players from winning a World Series: Ruth and Koufax.” That’s true for a lot of teams. I’m looking forward to going to Spring Training camp in Fort Myers and helping my friend and neighbor Bob McClure. Mac is the new pitching coach for the Red Sox. He’s a lefty with 19 years of experience in the majors. We think a lot alike. K.I.S.S. (Keep It Simple, Stupid) and with my 25 years experience will share some ideas that worked or didn’t work for us. I was flattered when I was contacted by Ben Cherington, the new Red Sox GM, to see if I had interest in passing on some of my ideas to their pitchers. I have always been a little puzzled that in over 25 years as an announcer, I had only two pitchers solicit advice from me. Billy Connors, Yankee pitching coach in 1995, had me spend a little time with Andy Pettitte. Not any instruction — just giving him a little preview of what it would be like to pitch in the majors. Roy Smith, a righthander that had a brief stint with the Twins when I was announcing their games in the late 80s always wanted to talk pitching with me. That is one thing I know helped me so much during my career. I asked Warren Spahn to look at my motion one evening in Minnesota when we were playing the Braves in an exhibition game. I’ll never forget his parting words, “Kid, when the game is tied in the 7th inning, the game is just starting for a starting pitcher.” My how times have changed! 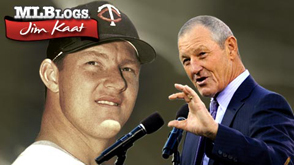 And I asked Whitey Ford as we both warmed up in the bullpens in Minnesota one night in the early ’60s, “Whitey, do you mind showing me how you grip your fastball to get that kind of movement?” He could have told me to not bother him. (We were about to face each other in the game!) He showed me, and I gripped my fastball like that for the rest of my career. They seem to find a way every few years to legislate against us: smaller strike zone, lighter bats to allow more bat speed, smaller parks and the DH. So we have to try to stick together and beat the system. I don’t think I have definite answers, nor do I think any coach does, but the object is to present a pitcher with a number of ideas that might help him become a better pitcher. I enjoyed doing that as Pete Rose’s pitching coach in the mid-’80s, passing along things I learned from Johnny Sain and Spahnie and Lopat, hoping they would help pitchers. Tom Browning won 20 games that year as a rookie pitcher, the first pitcher to do it since Bob Grim of the Yankees did it in the mid-’50s. Very satisfying for us retired pitchers to be able to do that. I look forward to having Mac as my boss and seeing if any of these old school ideas are still relevant in today’s game. I think they are, beacuse they’re really not old school. They are sound fundamental principles that have existed since Abner Doubleday or whoever you think created the game. There is nothing so sweet as the smell of a ballpark in the spring and the sound of the ball hitting the bat or the “thwack” of the ball hitting the glove as pitchers begin to play catch and go thru the boring but necessary fielding drills. That is the first rite of spring: pitchers’ fielding practice. Can’t wait to see it.